signed with monogram and dated 1864 l.r. 31 by 30cm., 12¼ by 12in. embroidered tunic and cascading hair. of that year when it was seen and admired by Lady Ashburton's close friend Pauline, Lady Trevelyan. The Ashburton house Seaford Lodge had only recently been built at Seaford in Devon and was being decorated in the fashionable Aesthetic style with etchings by Whistler and tiles and stained glass supplied by Morris and Co. Louisa Ashburton was a woman of strong character and it is perhaps significant that she bought a painting of a willful and defiant heroine. It is difficult to be certain about which of Rossetti's models Joan of Arc depicts. At this time there were a number of women that posed irregularly for Rossetti, including Aggie Manetti, Ellen Smith, Ada Vernon and a Mrs Knewstubb, the wife of his studio assistant. 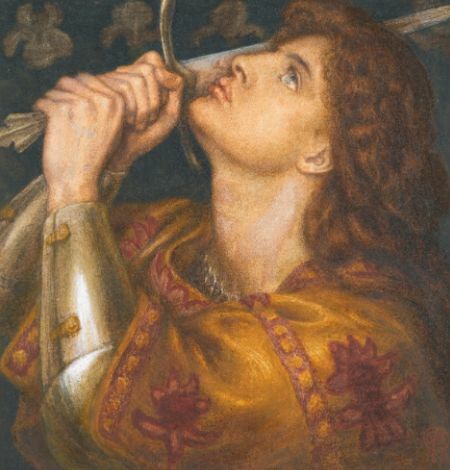 His brother William Michael Rossetti suggested that a German woman named Mrs Beyer posed for Joan of Arc but did not record which version she posed for and others stated that the model was Aggie Manetti, the Scotswoman that Rossetti painted several times. It is likely that the 1864 pictures depict an ideal of female beauty formed from an amalgamation of the features of several women. A notebook used by Rossetti in 1879 and 1880, contains a draft of an unpublished poem and in 1882, a few days before he died at Birchington-on-Sea Rossetti completed another painted replica of Joan of Arc (Fitzwilliam Museum, Cambridge) a weak and mannered painting that lacks the subtlety of the two pictures from 1864. This was the last picture that Rossetti finished, proving his enduring fascination for the subject.